Starbucks, Soekarno-Hatta International Airport, Jakarta, Indonesia - my name is Food. Starbucks Coffee offers your usual drinks and also assorted cakes and sandwiches. Having a branch basically everywhere, though in Brisbane may not be as much, they do have a high rating and turnout as in customers wise. The American chain seems to be doing well worldwide. Whilst waiting for my flight to Singapore, I couldn't be bothered walking around the airport or such so decided to have drink and a nibble and Starbucks was just the place to be. 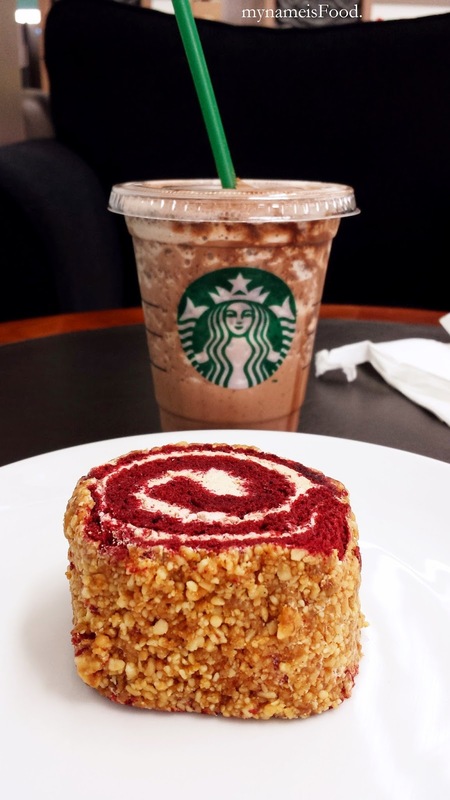 'Via Red Velvet Roll' (IDR25k = AUD$2.5) is a recent cake offered at Starbucks in Indonesia which showcases the increasing popularity of Red Velvet everywhere. 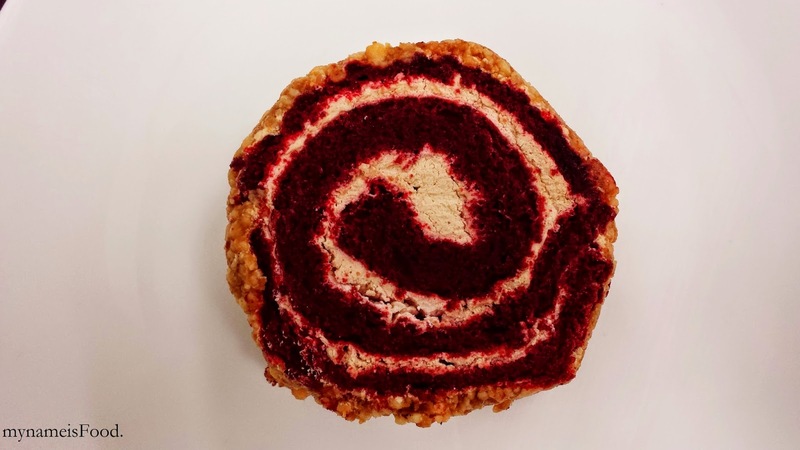 I'm sure most of you knows what Red Velvet is and why it seems that most cafes nowadays offers it either as a cake, whoopie pie, muffin, cupcake and so on. I guess they're just pretty and it doesn't make you think that they're actually just simple chocolate. 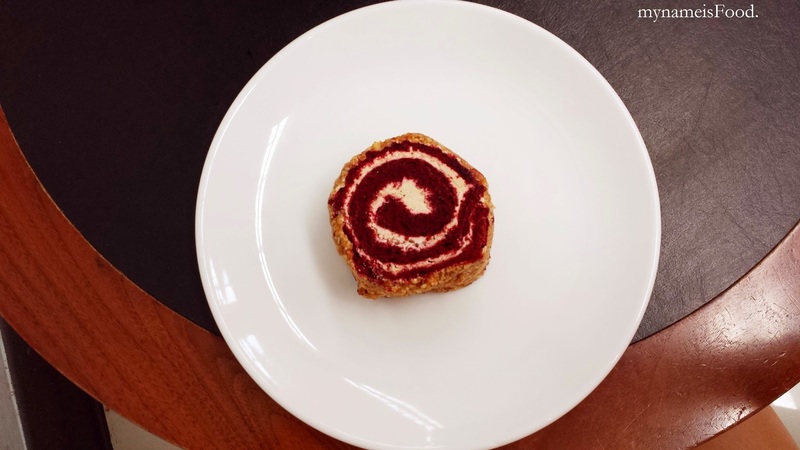 The 'Via' in the name of the roll was due to the fact that they have somehow added Via coffee inside the roll cake which gave it a mocha taste. The vanilla cream was too sweet for my liking but maybe that's because I'm not so much of a cream person. However, the red velvet cake was moist and had the right amount of coffee and chocolate which finally makes it taste like mocha. 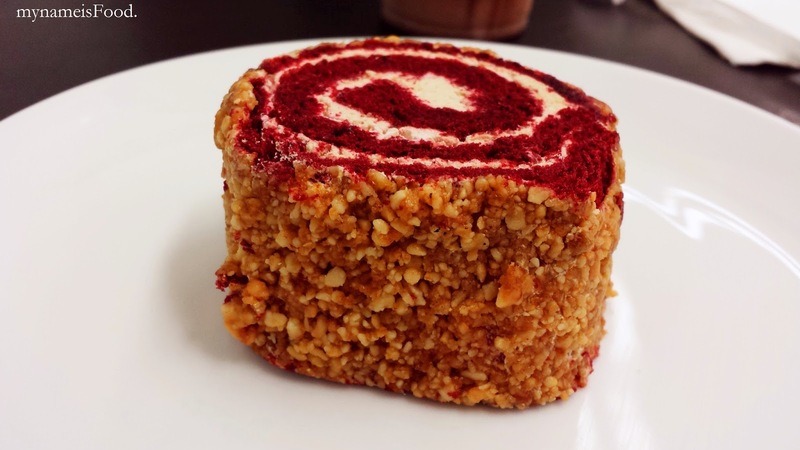 The outer part of it was quite unique I reckon, with crusted roasted peanuts as their outer layer was a nice touch and blended well with the red velvet but overall somehow it was quite chewy maybe because of it being kept in the cold all the time.